It’s the best time of year to appreciate all those great folks who cook for us, year-round, especially when there’s one person who just truly loves being the cook for the family. Whether that is your mom, dad, cousin or sister, I’m sure they’ll appreciate something like professional sous vide equipment to make them feel like more of a chef in the kitchen, especially for those who take cooking a lot more seriously than just preparing a meal for the family on the odd occasion. It’s time to show some love and respect. 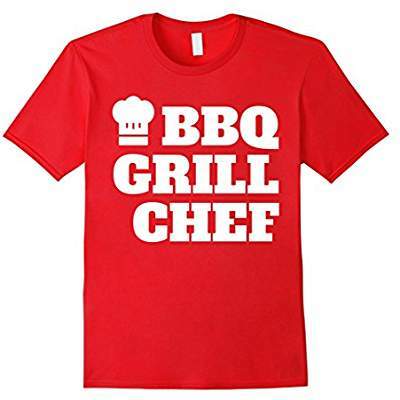 Grab a t-shirt for chefs this holiday season. These are hand-picked (no robots here at Food of History) and they gave me a lot of joy to search through. I’m not sure if me — or my husband — will be the one who needs one of these. We both cook a lot and we love to! So, you’re looking for some great gifts this holiday season for a chef? You’re in great luck, this is the ultimate list of t-shirts that some may or may not have worked with great t-shirt suppliers like GBLabels for chefs from around the web — just in time for Black Friday! Oh boyy! Your kids are gonna love helping you pick a t-shirt out for your dedicated significant other. You can help this blog keep publishing great stuff, and at the same time hook up friends and family for some of I’ve been scouring the t-shirts online to see what’s special this year in the realm of t-shirt gifts. 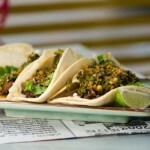 There’s sure to be a little something for every chef in this list, whether they cook pastry, steak or pasta. 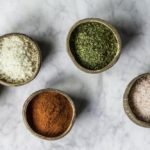 It’s okay to go through life with a little extra salt — as long as it’s not *only* in your food. If it’s in your personality, then this is the shirt for you. (Or that special someone this shirt reminds you of, right?) Get it here. Worn by a baker or the chick who loves her/him, this is a fun t-shirt that can have a lot of meanings. But mostly it says that us chicks like bakers. 🙂 Hubbie, please help with the cookies this year. And get yourself this shirt. Is this you? 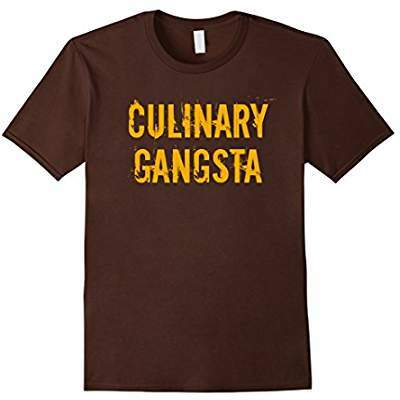 Are you the Culinary Gangsta in your fam? Meant for the chef cooking for the mob, or the chef who sorta maybe is in the mob (I’m reminded of Redd from Orange is the New Black in here.) Also can relate to other types of gangstas. Grab the t-shirt here. I’m not a mom, but I respect all of those raising kids in this crazy world. Especially when you somehow find the time to cook. Bravo! 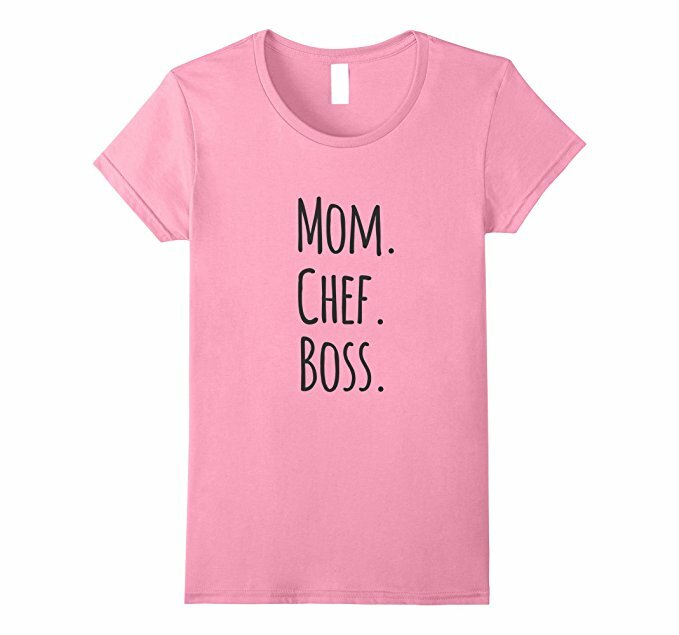 Your own Mom might deserve this t-shirt. Or just give it to a mom you know as a gift. Husbands and wives, take note! 5. 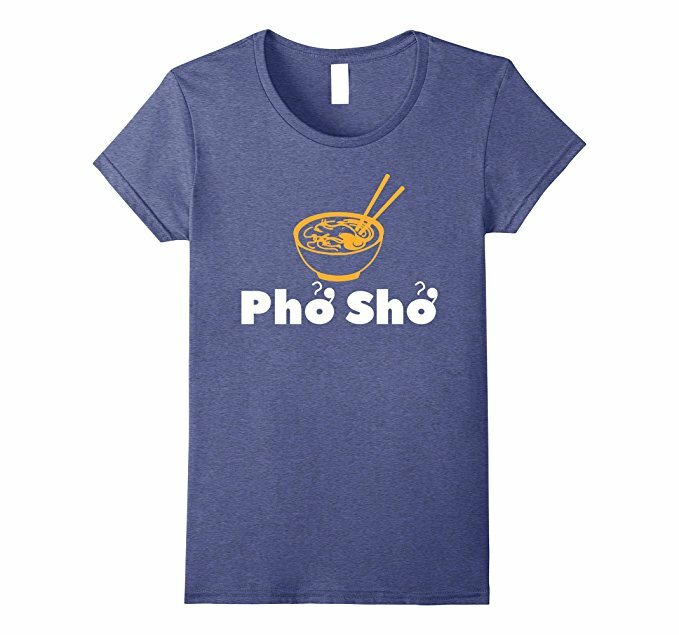 The ‘Pho Sho Shirt. Perfect for the chef that makes pho, or just loves pho, and other wonderful noodles. Also great for the foodies in your circle. For anyone that loves pho, pho sho! Grab it here. Any chef in your family with a great sense of humor will love, love, love this shirt. A great gift for somebody who is always working the breakfast shift -either in your family, or in your work life. This shirt says that we believe in that person, too! Grab it here. There are a lot of jealous people out there if this describes your relationship. Grab it as a gift for yourself or or your significant othere here. It’s a great little gag gift for the holidays. Get it via Amazon here. 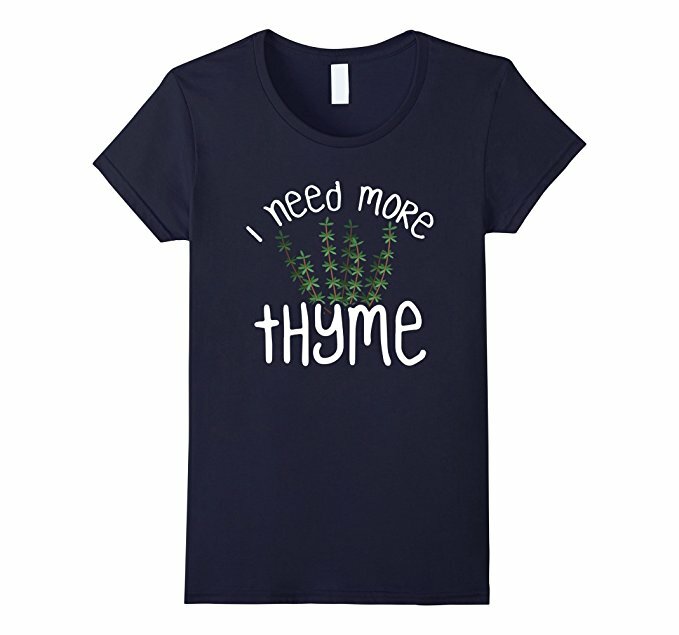 Don’t we all need more time…uh, thyme, at least, sometimes? If you know somebody who loves cooking with fresh herbs or maybe even runs out out thyme, frequently, then this is an awesome t-shirt to grab up for him or her. Shop it here. 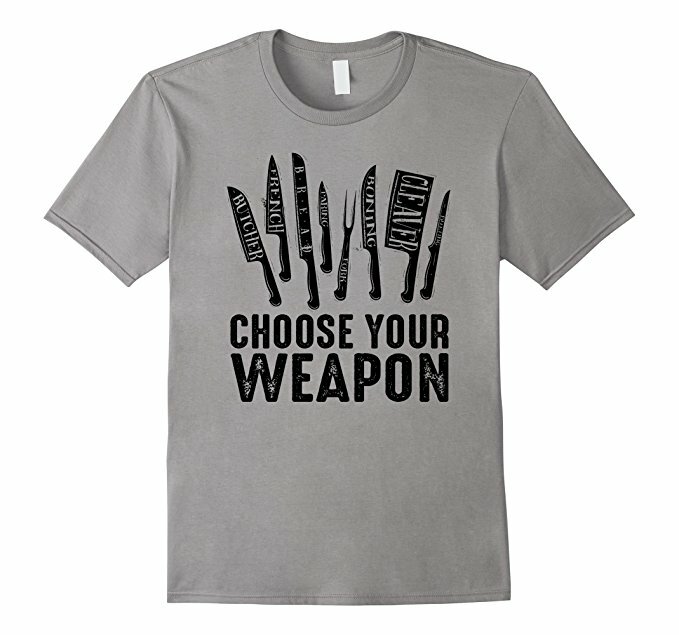 You know that guy or gal who loves their knives more than all of the other tools combined. There are a lot of people in love with their knife set. This T-shirt celebrates them. A perfect Christmas gift for that person in your life that wants to cook everything on the grill. Available here. One of the best superpowers to have, in my humble opinion. If you have a loved one who also loves to bake, this shirt is agreat gift — AND a powerful reminder you hope they will bake for you more often. Shirt is here. 12. 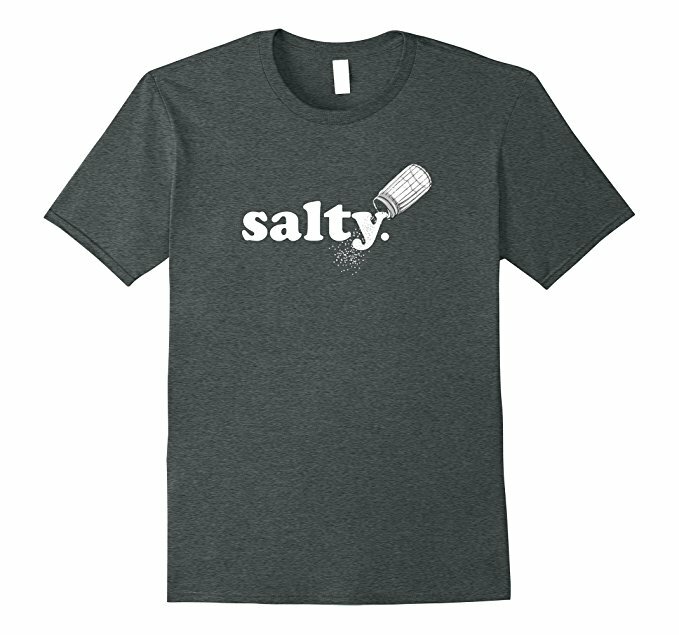 And last, but definitely not least, a t-shirt for anyone who rules the kitchen. 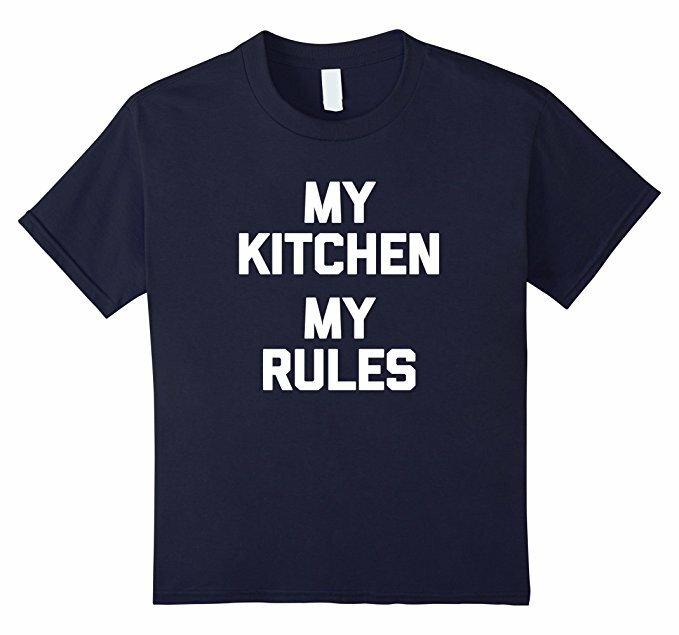 The assertive “MY KITCHEN MY RULES” t-shirt.